Others saw it and wanted one, so he started to hand-build and sell them. You can buy the latest Polecam today with more than 600 having now been delivered globally. Steffan has never stopped thinking of ways to apply new technology to make Polecam even better, and he still takes every opportunity to go out and shoot with it, whether it be up a mountain, on a small boat in the Arctic, or in an operating theatre conveying what the surgeon is doing to the big screens in the lecture theatre. Any other time he'll be back at base planning and trying new ideas. 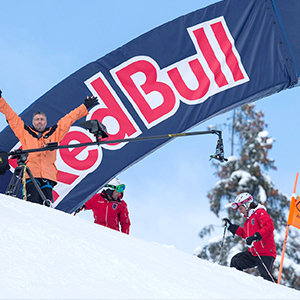 In February he was in Austria: "I returned to Kitzbuhel for the World Cup Skiing as part of the LMC Ultra Motion Crew. There were 3 Polecams, one on the start of the infamous 'Streiff', one at the Mousefahller, and one at the even more infamous Hausbergkanter. That was my location, with crampons and a harness and everything locked down with ice pins. Skiers shooting past me at 85kmh, and less than 1m away sometimes made throwing the boom around slightly difficult on the 65 degree slope. Polecam and the Antelope PICO camera on my rig (full HD with 350fps and instant replay) performed amazingly in the extreme conditions from -12 to +5 degrees. After 3 major crashes, all requiring airlifts off the mountain the race was stopped. A tough mountain for everyone!" Steffan has just launched a new product, Autopod, a remotely operated programmable telescopic elevation unit for use with rigs, cranes, remote heads, cameras, and more. It can be used as a standalone system on stage, in a studio, behind a goal, in a conference venue, or remote location to provide an unobtrusive camera position. Rumour has it that four Autopods will be used on the Adele tour. Info on the Polecam website: polecam.com. John Gillan didn't start shooting extreme, but does now. He recognised early on how Polecam could elevate a production to the next level and was an early adopter. He's built a successful career using Polecam on all types of programming. If you've ever watched those masterful camera moves on the Royal Chelsea Flower Show gardens, it may well have come from John and his Polecam. His skill is amazing. He now owns three Polecams, which is extreme in itself, but he's been covering the big car shows globally where companies like Jaguar-Land Rover, Ford and Honda have discovered that Polecam adds class to the press presentations. He is just off to New York with his three rigs for another show where he will operate one and provide experienced operators for the others. John says: "Polecam has made huge leaps forward in the last few years because Steffan has been pushing to keep ahead of the game and all the new technology. I took up the recent option of using a gimbal stabiliser on my rig- I use the Ronin M, and that allows me to use an HD minicam and Fujinon x17 HD zoom lens on my rig - that's a big heavy lens, unimaginable just a few years ago, not just regarding the size and weight, but also adding a live zoom capability to Polecam moves." "The Polecam team has done a great job with their zoom demand. They do a few electronic tweaks to the lens, and the zoom demand is designed around it. I think it's brilliant." The gimbal has helped enormously in his extreme shoots for Red Bull Media, helping to provide broadcast coverage for cliff diving events they hold around the world. He is usually positioned way up at the same height, or sometimes even higher than the dive platform. "One of the summer events last year was on an island in Possum Kingdom Lake, Texas. I travelled across in a small boat and after unloading there was a 100ft climb on a rugged trail in 100 degree heat. The island was infested with tarantulas and rattle snakes so a keen eye on the ground was essential." "It can be daunting at first especially if it's windy, and it usually is. I keep a harness on and tie the gear down, not forgetting the cases and bags as they could blow over the edge. It's been useful to learn a few essential Scout rope knots!" "Setting up on the huge roof of the Opera House in Denmark was difficult as it was lashing down with sleet and gusting with strong winds and the surface was slippery corrugated metal. I was working only about 6 feet from the edge." "I try to get the moves I want without getting my rig in the other camera shots, and I concentrate on getting a move that really shows the height and danger from the platform, a shot that can only be done with Polecam." "I bought my first Polecam nearly 20 years ago and operating them is all I do. I have developed my own style that clients seems to want, and think of the Polecam as an extension of my own arms and eyes, a bit like I'm a bird or even a fly buzzing around a subject getting shots that other cameras can't. I think Polecam is set to become even more popular in the future with the new much smaller (and cheaper) cameras on the market that will perfectly suit this lightweight jib." Polecam will be at NAB Expo in Las Vegas, USA on the Antelope Camera Systems booth #C11133.